To have any hope of escaping poverty, income from stable work is essential. Youth need to obtain skills that employers require while being involved in programs that focus on education and empowerment! This combination puts our youth on the right path, but there’s still work to do. We help CI youth and young adults develop workplace skills to help them be successful at their jobs and change their lives for good. Our Road to College & Career program prepares high school students for life after graduation. Through partnerships with TRIO, AVID, and Trojan Pathway, we strive to give our youth the best chance at college acceptance and success. 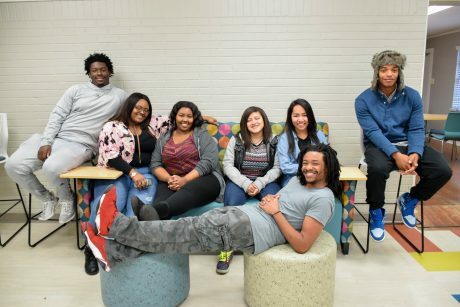 We connect CI youth ages 16-21 with summer work opportunities through outside programs, such as the City of Little Rock’s Summer Youth Employment Opportunity.Youth gain work experience and develop job skills by working at local businesses during the summer. Applications open around January, so be on the lookout! Now when our high school students graduate, they join the CI Alumni Network! The network is designed to support CI young adults ages 18-24 through community-building, job opportunities, educational resources, life hacks and more. During the Senior Ceremony in May, which honors our high school seniors, the students are inducted into the CI Alumni Network. If you are an alum, join the Facebook Group today! These competitive internships give CI Alumni professional work experience while pursuing their education. CI Interns work closely with staff in specific programmatic areas (Health, Education, Empowerment, Employability) to deliver quality work that increases the intern’s professional skills while furthering the mission of CI. Applications are available on the “Join Our Team” page in August, January, and May. For more information on our Employability programs, contact Susanna Creed, slcreed@ualr.edu.